The following photo was sent through by Michael of Adam and Eves. Adam and Eves was in Brunswick Street, Fortitude Valley and was open in the 70′s. As it says on the wall it was a happening season. 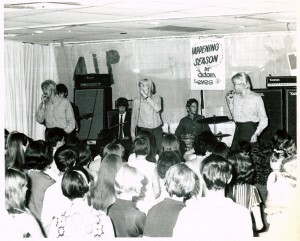 A lot of clubs in the 60′s and early 70′s were open at night but would also open on a Saturday or Sunday afternoon providing live music to the youngsters. Many were also unlicensed but that didn’t stop punters bringing in something stronger. If you went to Adam and Eves or any of the day clubs, let us know your experience. This entry was posted in 1970's, Clubbed Out. Bookmark the permalink. I remember Adam and Eves very well as my brother Don Baker was the manager, so many great Australian artists and groups played there including a lot of the local bands at the time . It was open on a sunday afternoon but had to be finished by 5 pm so as not to upset the church goers around the corner. It became Electric Circus next and was refurbished inside but still great Australian talent.